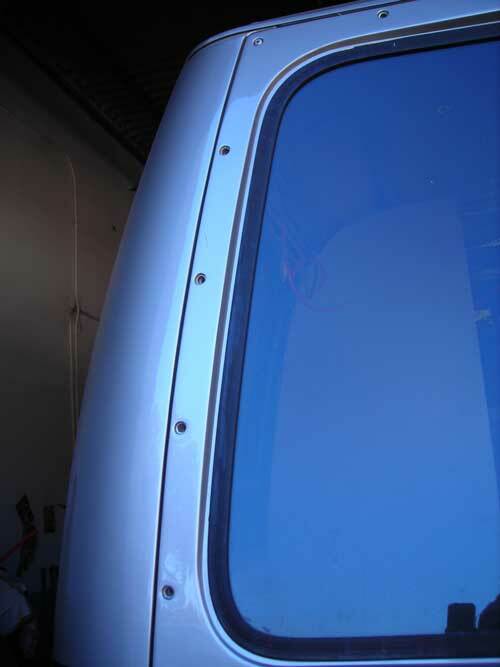 A quality finish touch on the rear of your coach are the rear panel screws. 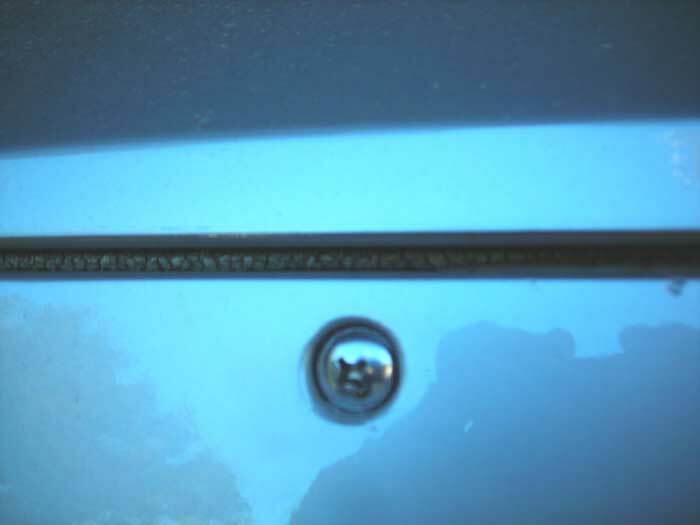 These screws hold on the rear panel of the coach– they have done their job for what 30 years? 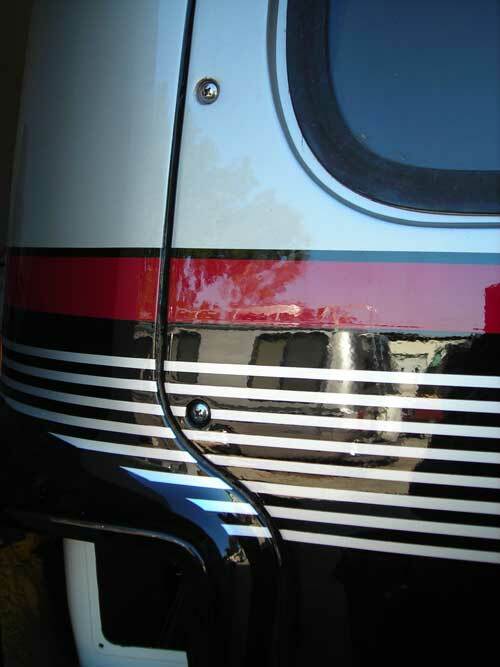 If you have a 73 or early 74 coach– it will be difficult to remove the original screws. The first year coach used a brass insert into the body and a 1/4×20 screw holding the panel on. 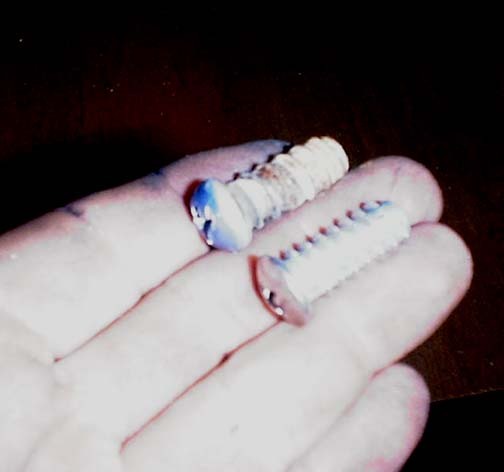 These screws are very difficult to remove without drilling them– sorry there is no good for you or anything on this page you can use without drilling the original screws out. 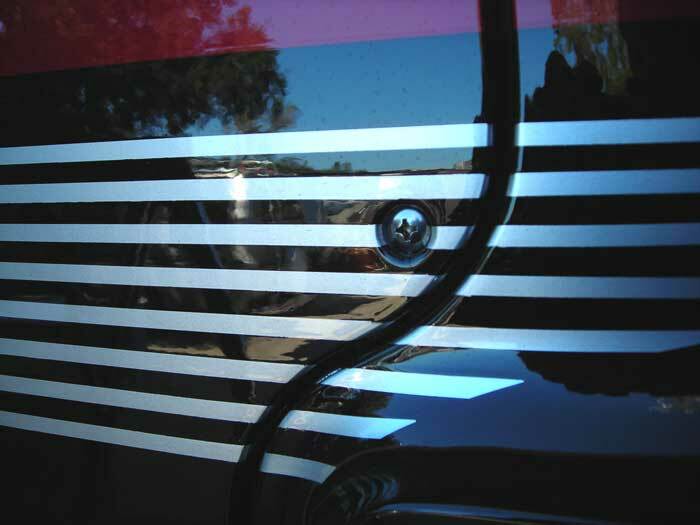 If your coach is not one of these– there is help, the original rear panel screws on the later units had a “high/low” thread pattern– it was threaded directly into the SMC compound and this high pitch double thread grabbed pretty well. 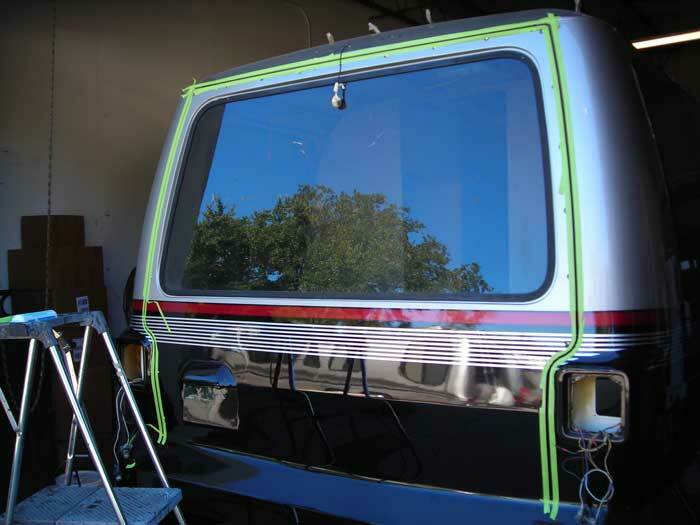 The years have affected the original plated steel screws and trying to renew the exterior of your coach cannot be accomplished by replacing these screws with this new stainless steel fastener assembly. it will bite back into the original “high/low” profile and give you a really new look. 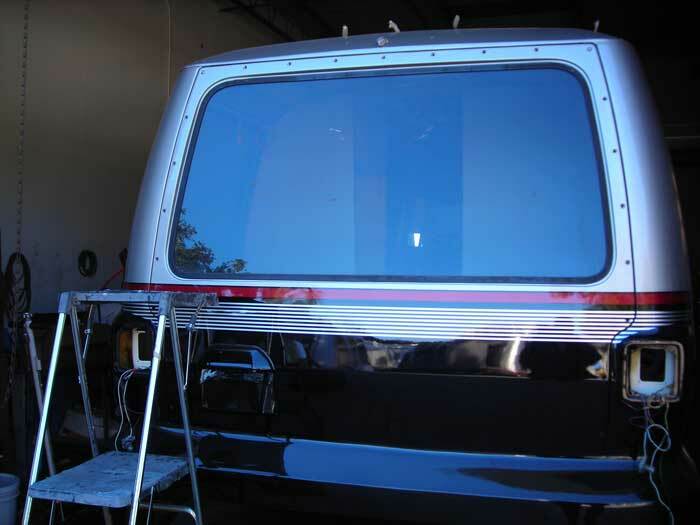 First of all, if you are refinishing the exterior of your coach, you want to break loose these rear panel screws before laying on the finish– I mean one slip of your screw driver during this job and you will ruine your day! Treat each screw as if it will give you the fight of your life getting it out. 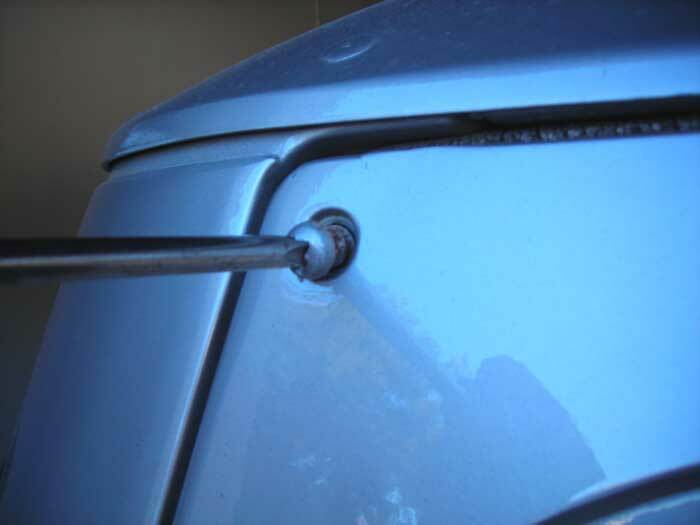 Clean out the driver slot, bottom your #3 driver tip into the slot, using a good sized hammer– “shock” the screw by hitting the screwdriver several times, this will help to break loose the corrosion holding the screw in the hole. Now with all you can do to loosen the screw, press in hard and turn the screw driver to just brake the hold the hole has on the screw– you may need to clamp a visegrip pliers onto the screwdriver for extra torque. When the screw moves (this just must happen, do what it takes) back it out slowly trying not to damage the threads in the hole. As I said, you want to remove these screws before you paint but please at least put back screws at the corners to keep the panel from falling off! OK, not the screws are out– this is easy to say but you may find one or more screws give you a bit of trouble, hey maybe not but listen– they all need to come out. The screws across the bottom are not the same fastening system, those are sheet metal screws, let us know that you want those as well when you order these screws and we’lll make sure they make it into the order– they are not very expensive. Now, we shoot a small amount of RTV sealant in each hole — now just a little, too much and the stuff squishes out and makes a mess. 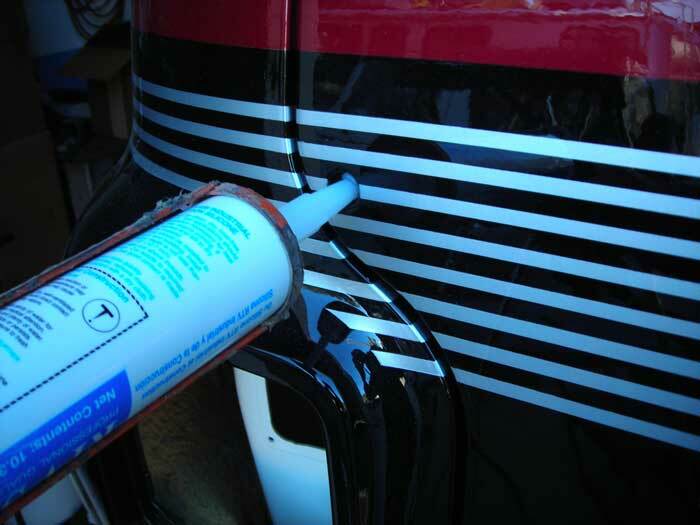 I do this for 2 reasons– fist it acts as a lubricant to allow the new stainless screw systrem to thread completely into the hole without binding then when it cures it acts as the sealant it was made to be. These screw holes actually go all the way to the inside of the coach and can leak water! 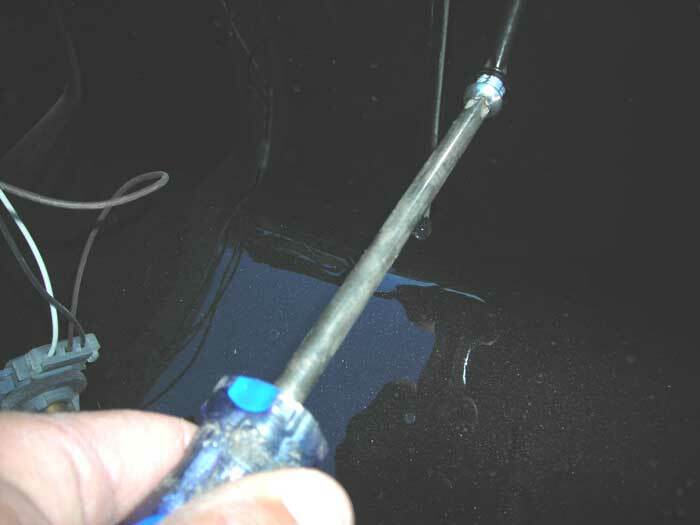 Get a good bite on the screw with your driver, you just do not want to strip out the stainless head– that does not look “cool”. 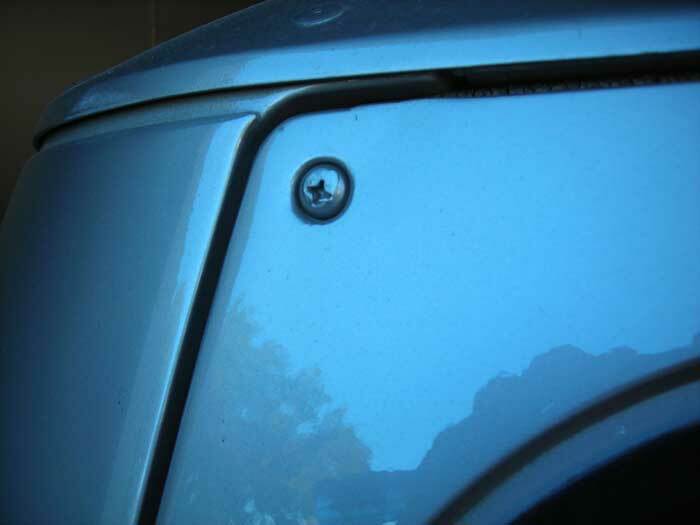 Do this 24 times and you have the rear panel screws all in and isn’t that a clean, finished look? 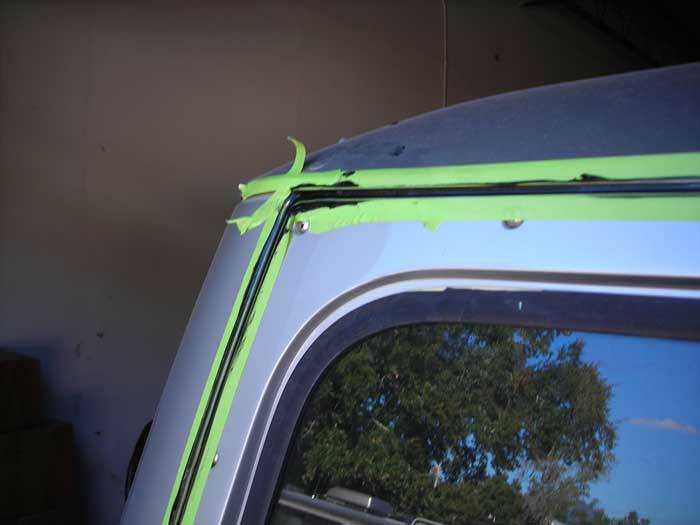 But wait, there is more to do– the rear panel is sealed with a piece of foam tape from the factory which has been doing it’s job for what 30 years? It needs help to, look at all of the cracks in it inside the recessed slot. Something needs to be done to not only seal this possible leak but to also update the look of the seam. 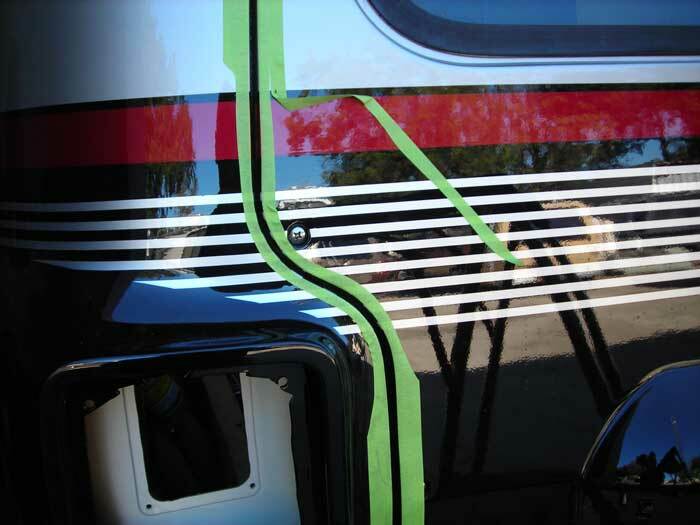 Here, we tape off the seam on both sides , BTW, slitting the 3/4″ masking tape allows you to bend it accuratly around corners– no more fifty million llittle pieces of tape to make a corner (thats a little pro freebee), tape off the entire seam, then with the black RTV sealant fill that mother up , with your finger make one complete swipe “coast to coast” and pull the tape right away. This will make up a really good seal and actually accent the seam nicely. Thats it, the rear of the coach has been sealed and updated to it’s new look. Sounds easy right— well, it’s not that hard but you just really need to be carefull– and have the right parts! Yes, you can go out and try different sealants and even different screws but I gotta tell ya why would you want to reinvent the wheel when we have already figured it out. Yes, in this day of internet searching you may find all sorts of ideas but wait– what is our goal here– is it to make your coach look as good as it can be with the least amount of time, energy and money? Well give me a call and with that one call all the parts will be on the way to you AND I will be here to help you with any question while doing the job— see if that guy standing in the phone booth in North Dakota can help you when you try and find all the parts to do this simple but very important job! Enough said on that one, give me a call– let me help you and let me get to you the exact same parts we use to do this job.